The North Shore Yacht Club offers an seven-week Learn to Sail Program that begins in early June. Classes meet until noon either Saturday or Sunday mornings, depending upon enrollment and class preference, with no classes on the July 4th weekend. Students are taught the fundamentals of rigging and sailing using club owned Sunfish and are supervised by our US Sailing certified instructors. This course is intended for adults, high school age and older. The first day of class is held at the Highland Park High School pool where students are asked to demonstrate the ability to successfully tread water for two minutes and swim the full length of the pool. We also cover basic safety skills in the pool including righting a capsized sailboat. All other classes are held at the Park Ave Boating Beach in Highland Park and on Lake Michigan waters. 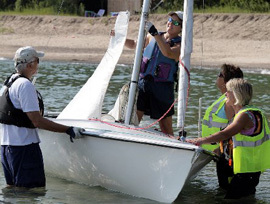 Once students have obtained basic skills in Sunfish boat handling, they are encouraged to make use of the club boats and are welcome to sail with other experienced sailors throughout the summer season. We practice the safe boating "buddy system" where no one sails alone and a PFD is required to be worn on the water at all times. Students must register with a Full Membership to the NSYC, and then register for the NSYC Adult Sailing Class Event. All Membership Information and Learn to Sail class registration can be found on our Membership tab along with important General Club Guidelines. Check out this excellent short NSYC video on Rigging a Sunfish. or email us at LearnToSail@NorthShoreYachtClub.com.